The Great Cloth Diaper Change coincides with Earth Day. What a great day to help bring awareness to cloth diapers. The event is a world wide event changing as many lil bums into a cloth diapers. 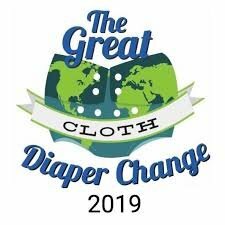 We are back to trying to break the current record stands at 8,459 qualifying participant pairs for “the most people changing (cloth) diapers in a "48 hour" around the world! Join us for kid activities, the diaper change and a raffle at the end with some amazing prizes. Diaper change is at 3:30 on the dot. Please show up at least five minutes before to register.